Summer is in full swing across Canada. So whether you prefer a cool water hot tub or a super warm soak, one thing is for sure: you need to keep hydrated! Herb, veggie and fruit infused water has been all the rage in recent years. While there is certainly no shortage of online recipes (just Google “fruit infused water” and you’ll see what we mean), just how can you be sure the suggestions will quench your thirst? You let the team at Hot Tub Covers Canada do the testing for you! Our team is filled with hot tub and swimming pool enthusiasts. Many of us also have kids, so trying to find something to please the younger set and adults is always forefront. So without further ado, here are the most popular pool party and hot tubbing thirst quenchers. Mix together in glass pitcher or mason jar and allow to infuse for at least 6 hours in the refrigerator. 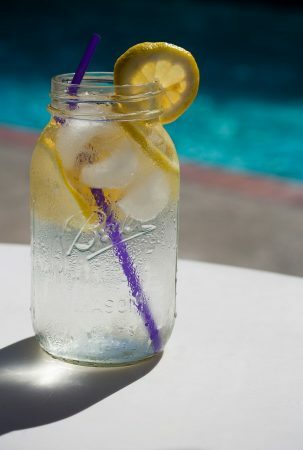 Mix together in glass pitcher or mason jar and allow to infuse for at least 4 hours in the refrigerator. Kids Suggest: Letting this sit overnight in the fridge for the strongest flavour! Place 4 cups 1/2 inch-cubed watermelon (about 1 1/4 pounds; lightly smashed) and 6 sprigs mint (lightly crushed) in a pitcher. For still infused water, add 2 quarts of water. For sparkling water, add 1 quart of seltzer during prep and a second quart just before serving. Refrigerate 2 to 4 hours to allow the ingredients to infuse. Stir well and strain, discarding the solids. For serving, add fresh watermelon and mint sprigs for garnish and plenty of ice. The infused water will keep refrigerated for up to 2 days. What kid or adult can refuse fresh berries?! This team favourite comes from the Berry World website. Adults Suggest: Adding some freshly grated ginger for an added kick! Share Your Family Favourites with the Hot Tub Covers Canada Team! Does your family have a favourite poolside or hot tub drink? Let us know in the comments or connect with us on social media!